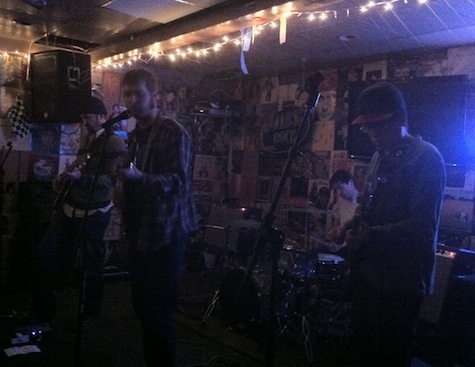 The Lupines at O'Leaver's, Nov. 10, 2011. First up last night was the screening of The Adventures of Prince Achmed to what looked like a more-than-half-filled crowd at Film Streams. Jake Bellows, Ryan Fox and Ben Brodin set up shop in the first row of the facility’s big auditorium, where amps glowed just under the screen. I’m happy that I remembered to bring earplugs. It was loud. Not painfully loud, but loud for such an enclosed space. It also was trippy. Very trippy. The images by themselves were a psychedelic head-trip without Bellows & Co’s innovative “score,” which glided between somber ambient tone shifts, electro-dance mantras, space-folk feedback and chord-driven mountain rock. I wouldn’t say the styles seamlessly matched the screen, but most of the time I found myself lost in Achmed’s weird Eastern netherworld filled with wizards and monsters and proud people doing magical things. BTW, next up in the Silents in Concert series Dec. 1 is the 1966 surf classic The Endless Summer, featuring music by Matteah Baim, whose ’09 album, Laughing Boy (Dicristina Records), got a 7.2 at Pitchfork. Next, it was off to beautiful O’Leaver’s for the debut of The Lupines. While writing this before work this morning, I listened to Brimstone Howl’s Big Deal album, trying to ascertain the “differentiators” between that band and this, John Ziegler’s new project. There were obvious similarities, not the least of which was Ziegler’s big-shouldered vocals delivered with its familiar dead-pan snarl on garage rock songs that dwell on the downside of love. If you like Brimstone, you’ll like Lupines. The real difference (to me) was Mike Friedman’s guitar. Friedman has always been a secret weapon in any band he’s played in — one of Omaha’s best unheralded guitarists. The “unheralded” status may be at risk now that he’s in this band, especially once people hear his freak-out solos and their interplay with Ziegler’s own frenetic guitar style. Holding it together was Iron Mike Tulis’ rock-steady bass lines and Javid Dabestani’s forward-leaning drums. If anything, The Lupines seem less campy and more punk than Brimstone ever was, and at the same time (ironically) more serious and more refined. For a debut performance, they were tight as tics and sounded ready to enter a studio, but I guess that’s what you’d expect from this band of rock veterans. Openers, Detroit rockers Gardens, were a by-the-numbers garage band with brief forays into psych rock and a gift for between-song gab. “We just drove from Denver,” said the drummer. “There was nothing to see. Not even any trees. Just cow concentration camps. This next one’s a big kiss for Omaha.” Unfortunately I didn’t see any of the dozen or so people on hand puckering up. On top of the list tonight is, of course, the Speed! Nebraska 15th Anniversary rock show at The Brothers Lounge, which you read about yesterday. On the bill: Ideal Cleaners, The Wagon Blasters, Domestica, Techlepathy and The Filter Kings. Show starts at 9 and will run you $5. This one should be a hoot. Also going on tonight in Benson (but not affiliated with the OEA event) is the Down with the Ship CD EP release show at The Sydney with Arrah and the Ferns (Philadelphia, Pa.) and Bazooka Shootout. $5, 9 p.m.
Also tonight (but not in Benson) is Ragged Company’s CD release show at The Side Door Lounge. 9 p.m. and absolutely free. And jeeze… did I almost forget Depressed Buttons are performing down at House of Loom tonight? Brent Crampton opens. $5, 10 p.m.
On Saturday night the decisions become even tougher. At The Waiting Room, Lonely Estates has its CD release show for their new self-released album The Invertebrate. Lonely Estates is former members of Malpias (minus Greg Loftus) and includes David and Luke Backhaus, Phil Reno, Scott Evans and fronted by Braden Rapp, The album was recorded by AJ Mogis at ARC Studios. I’ve been listening to it off and on for the past couple of weeks and would say its sound is huddled under the same indie rock umbrella as Criteria and Little Brazil. Big, soaring anthems with big, soaring vocals and guitar solos and lots of harmonies. Worth checking out. Opening the show is Brad Hoshaw and the Seven Deadlies, New Lungs and Blue Bird. Quite a lineup. $8, 9 p.m.
Over at O’Leaver’s Saturday night it’s the return of Digital Leather — and I’ve never seen a bad O’Leaver’s Digital Leather show. Add to that Noah’s Ark Was a Spaceship and you’ve got another solid rock bill. $5, 9 p.m.
Can I go to both shows? No, I can’t. Also going on Saturday night, Lincoln instrumental rock trio Machete Archive plays at The Sandbox with Fetal Pig, Super Invader, Class M Planets and 13th Year. $8, 9 p.m. Meanwhile, over at The Barley Street Tavern Saturday night, Jake Bellows breaks away from his work at ARC studio to perform along with The Betties and one more band. $5, 9 p.m. The weekend ends Sunday night at The Slowdown when City and Colour takes the stage with Hacienda and David Romano. Tickets are $22/$25 DOS (and I hear they’re going fast). Show starts at 9.